Robert Pattinson didn't like how Kristen Stewart told the public she was sorry for cheating. So Rob has apparently moved on after his good friend, Katy Perry, urged him to take a break with Kristen. And it seems like Rob isn't going back to Kristen anytime soon. He told her to move out of their shared home in Los Feliz, CA., right after the news broke that Kristen cheated on him with Rupert Sanders. 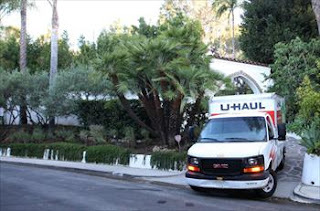 A U-Haul was seen in the driveway Saturday morning. Sources say the "Twilight" hunk has a few words for Rupert, "Rob wants to have a man to man chat with Rupert to find out exactly what happened between him and Kristen," a source told RadarOnline. "Kristen has already betrayed his trust by cheating, so he can't be sure that she will tell him exactly what went on between her and Rupert. Rupert has a wife and a family to save, so Rob feels like he has nothing left to lose and would be honest with him." RadarOnline talked more with the source, who says Rob didn't have a clue about the cheating, "He was hurt and heartbroken, then angry and pissed off, and now he just wants answers. He feels like he needs to know exactly what happened, how far it went and how many times, so he can figure out if this is something he can move past."